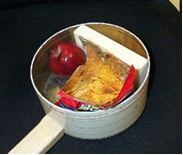 Todd Korup ("The Uker of OZ" in OZaukee County, WI) made a ukulele out of a Hormel sausage tin. He calls it the Sausage Canjo. "The great thing about it is it serves a double purpose! It is also my lunchbox! It's a great way to always have a uke with me throughout the day for those times when I need a little 'stress relief,' a couple chords and I'm good to go." Groovy! I just finished one made from a piece of oak flooring and holiday cookie tin I found at the dump! It's strung up with different gauge fishing line, which is not as good as real strings, but keeps the project within the frame of where I wanted it. I am doing a second along the same lines right now, but trying new construction techniques. This is going to be made of a maple draw front and a butter cookie tin. I know some thing else you can strum or stroke for stress relief.